Few people realize that Leyte island has a lot of centuries-old churches. Since I was in Cebu, I decided to make a sidetrip to Leyte and Southern Leyte since there are convenient ferry services to various points on the island. I had wanted to go straight to Maasin, Southern Leyte but there were no fast crafts available. So after walking from one pier to another (the port of Cebu has several passenger terminals that service various areas), I found a ferry service to the nearest port to Maasin which is Bato, Leyte. I spent PHP300 for the fast craft trip that was scheduled to leave at 9 a.m. It was a bit rainy and I was told they were still deciding whether to set sail or not since the water was a bit rough. But we left, albeit a few minutes late, and arrived in Bato at about 12:30 p.m. We had to pass a slightly different route to avoid rough waters so the trip was 30 minutes longer. From Bato, I backtracked to the town of Hilongos which has a fortress church. I immediately noticed the bastions and ramparts and walls of the fort. Don't be fooled by the current church. 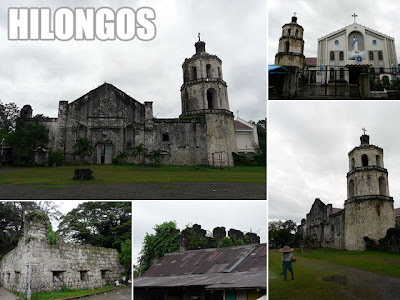 The good thing about Hilongos is that when they built the new church in the 1960s, they did not demolish the ruins of the old church which was destroyed during the Philippine-American War. It's the orientation which changed, the remnants of the old church now forms the transcept of the new church. And the old facade can be seen inside the school grounds. 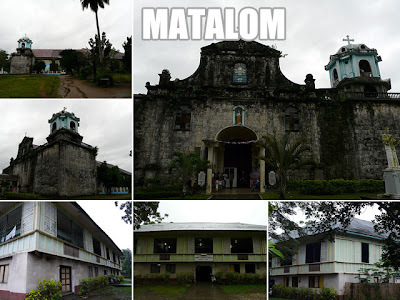 My next stop was Matalom, the town after Bato. Its church is also well-preserved except for the altar. It also has a detached convento which is equally-preserved. Behind the town hall is a square watch tower. Maasin City is right after Matalom. But it's quite a distance. And on the usual rickety public bus, It will take you about an hour to get there with all those stops to pick-up passengers. One thing you have to take into consideration when taking public transport in these parts of the country is the waiting time for a bus or jeep to arrive. 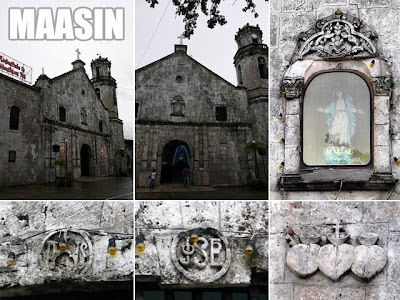 I was in Maasin before sundown and got to visit the Maasin Cathedral (again, the altar has been altered) before looking for a place to stay for the night. Before calling it a night, I visited a store that sells bocarillo (dried coconut candy) in Barangay Ibarra, several kilometers from the city center. Try visiting the Samar island :) There's this beautiful rock formation in Biri, Northern Samar then a surfing spot in Western Samar and numerous caves and falls also.